LORIS, SC - Myrtle Beach Area golf courses that offer stunning, often-spectacular views are commonplace. 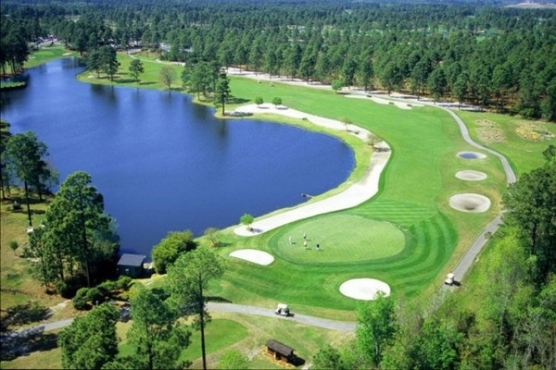 To say that Woodland Valley Country Club has a unique place in the Myrtle Beach Area golfing scene is certainly not an understatement. Head Golf Professional at Woodland Valley, William "Willie" Love stated it this way, "Our course winds through the area's natural beauty and is untouched by the hustle and bustle often found on the beach courses." The course is truly located in a pristine setting. Hardwood and pine trees line virtually every fairway. If memory serves me correctly, there are only two holes that parallel. Even the five or six houses found on the course do not intrude and spoil the beauty of this Russell Breeden designed masterpiece. As you gently wind through this handsome venue, you cannot help but feel relaxed, regardless of what direction your game is going. However, be careful and do not get lulled to sleep. Woodland Valley requires your "A" game. I left mine at home and it showed! The course is a robust 6907 yards from the Championship tees; a challenging 6390 from the Back Tees, 5690 yards from the Middle tees and 4945 yards from the Forward tees. There is plenty of length available for the big hitters, but Woodland Valley is very accommodating to the golfer that can control his drives. Of course the 150-yard marker is always a great target, but the course does present plenty of risk-reward opportunities. Gentle doglegs and generous fairways on quite a few holes present a chance for a well-placed driver to pay-off. Likewise bunkers, mounds and an occasional water hazard positioned on the top of the doglegs stand ready to catch shots that run through the fairway. Gentle elevations and strategically placed hazards impact approach shots, but nothing that requires game altering tactics. Remember, Woodland Valley may appear to be a mountain course, but remember it's still close to sea level. Choose your clubs wisely. Weather can change the character of this course dramatically. Tree lined fairways disguise strong winds as gentle breezes. Just a little dampness on an elevated green eliminates roll. But, the fun is just beginning. Once you've navigated both the gentle and dramatic doglegs; weighed all your club options and hit the perfect approach shot; it's now time to putt! Considering this is a public golf course with a modest maintenance budget, the greens are tremendous. Woodland Valley is one of the first courses in the Myrtle Beach Area to use Jensen Ultra Dwarf greens. Although recently over seeded, it was easy to see that these are truly good putting surfaces. Our putts were fast and the lines true. These greens are going to be in great shape and even more challenging within the next two weeks. The first real test on Woodland Valley presents itself on the Par 5, 2nd hole. It's all you want at 555-yards from the White Tees and deserves the #5 handicap designation. Take your drive down the center to a slight knoll and you'll enjoy some extra yardage. I tried the right side thinking a little extra roll off the slope. Unfortunately, my ball stayed up and I brought the water on the left into play for my second shot from a pull/hook lie. Of course I over adjusted and pushed one deep into the woods on the right. A green that peaked in the center and runs toward the fringe finishes this challenging hole. Number 6, the #1 Handicap hole is a relatively short 370-yard Par 4. Just 225-yards to the environmentally protected area requires an accurate drive. Be cautious the hole slopes down after the 150-yard marker. Water and a large trap protect a very difficult putting green. This hole is absolutely gorgeous. Number 13 is a great example of a risk-reward opportunity. This severe dogleg left features a large trap that just begs you to fly-it and position yourself with a wedge into the green. A large trap on the far side of the fairway will catch any errant push/slice drives. The well placed drive leaves a downhill approach shot. Depending on the pin placement this is a great birdie opportunity hole. Number 16 is an outstanding Par 3. All that's required on this 180-yard gem is a perfect shot that clears water and sand in the front, sand to the right, and woods to the left. The green is challenging and even hitting this one in regulation may require a three putt to get off. This course has very few downsides, but two need mentioning. Yardage is not well marked and if exact measurement is critical to your game, you will have issues. Also, the beauty of the course is its tree-lined fairways, but with that comes a lack of sunshine in a few areas. Although the rain we've had over the past three weeks guarantees some great playing conditions this winter, some areas of the course will be very slow to dry. Woodland Valley Country Club is a very pleasing venue. The staff is hospitable and the practice facilities from the driving range to the putting green to the chipping green are more than adequate. Most importantly the course is truly unique to the area and an absolute pleasure to play. It's the perfect stop on your way to the beach when traveling Route 9, or a fitting ending to a great golf trip on your way home.